This line is reasonable price, classical line and amature model. 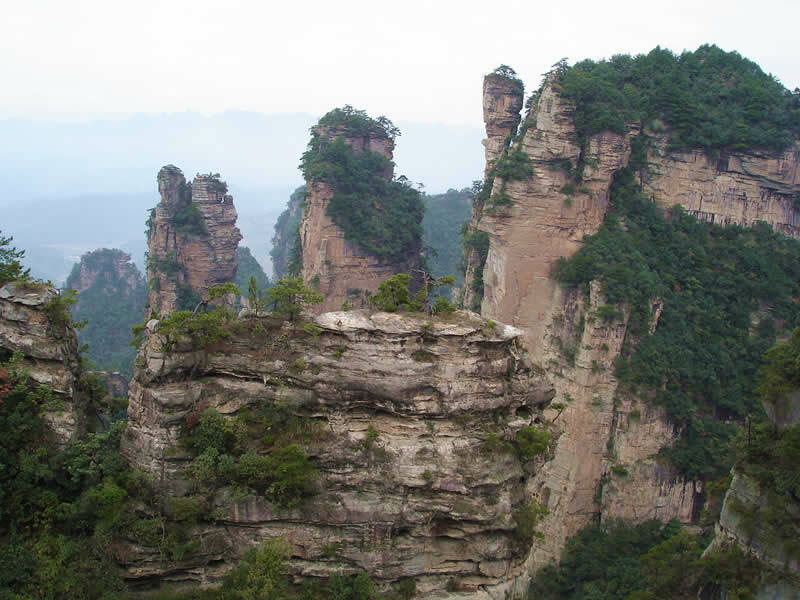 You can also visit the most essential and the most famous scenic spots in Zhangjiajie! 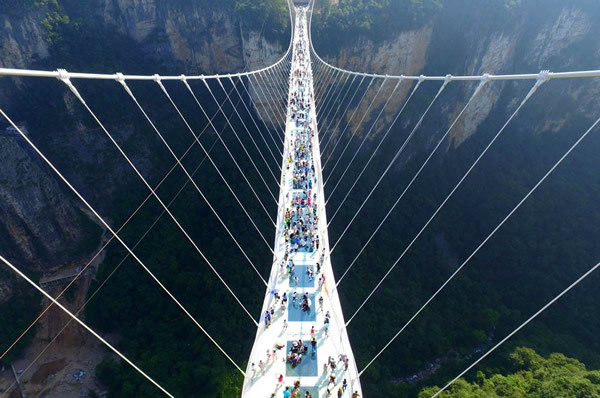 And you can enjoy the longest glass bridge in the world! In the morning：The guide or driver will pick up you in Zhangjiajie airport or in bus station or train station or in hotel where you live. The travel car will go to the first national forest park―The National Forest Park of Zhangjiajie. It needs to take about 40minutes by car arrive there. The entry fee is 245RMB plus 3RMB insurence fee. After we enter into the park, we can see the big oxygen bar square( including 8-10 million negative oxygen ions per cubic centimeter of air). When we land at the altitude of 1200 meters, we can see the biggest sightseeing stand in Zhangjiajie. And then we will visit the Yellow Rock Village scenic area. We can choose to take the cableway up and down and can also walk up and down. If you take the cableway that needs to take 65RMB/P one way and 118RMB/P round and you need to buy the cableway ticket by yourself. Yellow RockVillageis the most important spot in Zhangjiajie National Forest Park. It was highly praised by a famous poet: “It makes us surprised in five steps, astonished in seven steps and shocked in ten steps.” And now, let us enjoy the beautiful. Walk along the way, we can see the Six Wonders Pavilion, the Star-Plucking Terrace, the Five Fingers Peak, the Natural Mural, the Echo Wall and so on. In the morning：After the breakfast, we will take the car and go to the Biaozhi Gate of Wulingyuan, and then we will go to Yuanjiajie about 30minutes by the environmental bus. And then we will take the biggest elevator in the world--Bailong Elevator. (Please attend: some small traffic vehicles which are not included in the arrangement, it needs to pay by yourself. The Bailong Elevator needs to take 72RMB/P one way.). Or?we can go to Yuanjiajie by foot. And then we will visit the Heaven Column, which is the prototype of the Hallelujah Mountain in the movie of Avatar and we can see the nature stone bridge―The First Bridge in the world. (The absolute height of the bridge pier is 354 meters. )、Eight Diagrams Pictures and so on. 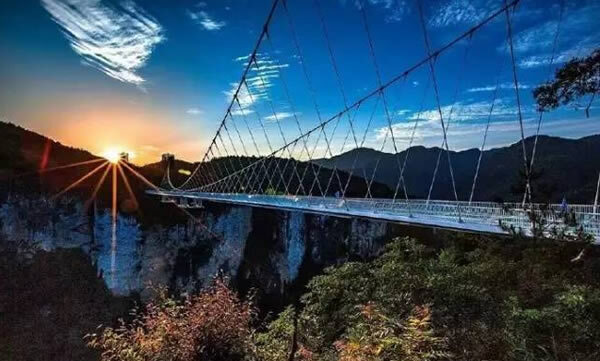 And then we will take about 40minutes by the environmental bus and go to the Tianzi Mountain for visiting the surprised peak.Tianzi Mountain was ever named?as “the king of the peak”. Thousands of mountains stand in the clouds. We can see many other scenic spots, for example, the Tianzi Pavilion, the West Sea Stone Forest, Helong Parkand so on. In the afternoon：We can choose to walk down the mountain. (Generally, it needs to take about 2hours by foot.) Or, we can choose to take the Tianzi Mountain cableway to down the mountain. (It needs to take 72RMB/P one way and you need to buy the ticket by yourself. )?In the bottom of the Tianzi Mountain, we will visit the Ten Miles Gallery scenic spot. In the Ten Miles Gallery, we can sight it by foot that needs to take about 1hour. Or, we can take the sightseeing train. (The train is 38RMB/P one way and you need to buy it by yourself.) Along the way, we can enjoy many attractions, for example, the Three Sisters Peak, the Old People of Gathering Herbs, the Tigers Roar to the Sky, the Xiang King View the Book and so on. Day3：Zhangjiajie Grand Canyon--1day tour and back to Zhangjiajie city and send group. All-day： We will go to the Zhangjiajie Grand Canyon scenic area which is rich in the original ecological vegetation. It needs to take about 2hours by travel car. It is said that the Zhangjiajie Grand Canyon is named “Little Jiuzhai Valley”. The entrance fee is 118RMB/P which is included. 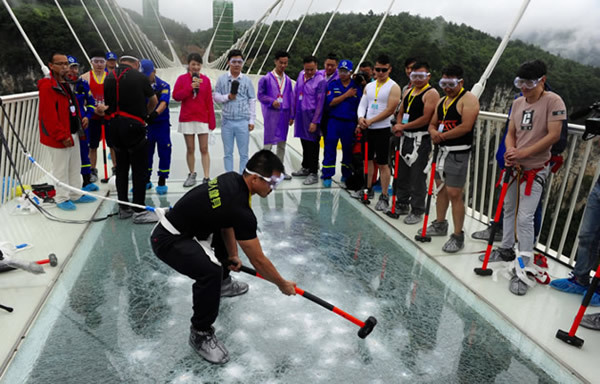 And we can visit the longest glass bridge in the world―the Glass Bridge of Zhangjiajie Grand Canyon and the ticket is 138RMB/P which is included. (Please attend: You can choose to go to the glass bridge or not.). Zhangjiajie Grand Canyon is located in Sanguan Township of Cili County in Zhangjiajie City and is close to the world natural heritage and the world geological park�C Wulingyuan scenic area of Zhangjiajie. It is a new development and construction of scenic spots. Zhangjiajie Grand Canyon combining mountain, water and hole, is the landform museum of Zhangjiajie. Here you can enjoy the scenery of all Karst terrain of the North Temperate Zone! There is a quiet and nice stream in the middle of Zhangjiajie Grand Canyon . Beside the stream, there is a path built by the plank. Zhangjiajie Grand Canyon has not only traditional beautiful natural scenery, but also has historical and humanistic landscape of three generations. As “Thousands of Graves”, the ancient battlefield that recorded the fierce battle of Lizicheng and Wusangui, the bandit hole reflected the history and characteristics of the Xiangxi and the Southern Red Flag Canal and so on. The main attractions: One-Line-Sky, High Ladder-Plank, the Three Fold Path, Cliff-Crack, Rainbow Square, Immortal Washing Face, Butterfly Spring and so on. And then we will back to Zhangjiajie city and finish the pleasant trip! 4、Ticket：Provide the entrance tickets of the scenic spots in the above itinerary.（The entrance fee of Zhangjiajie National Forest Park is 248RMB/Per and the entrance fee of Grand Canyon and the ticket of Glass Bridge is 256RMB/P）.